Matar Paneer is one of the classic north indian preparation and every one has there own favorite recipe. My matar paneer recipe is quick to whip up if you have frozen paneer and peas in freezer and i think everybody has that in freezer these days. Growing up my mother cooked traditional south indian fair at home so matar panner was considered a delicacy for us to be enjoyed in restaurants and north friends home. But when i started cooking matar paneer is the first recipe north indian i learnt my friends mother and whenever i would make at home my father would love it :). 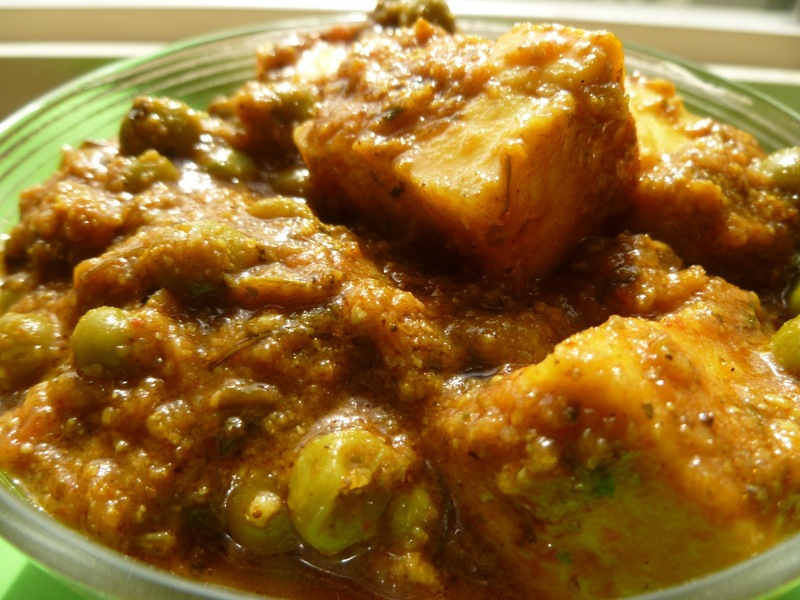 But in those days matar paneer was a winter preparation as fresh peas where available only in winter but now we all use frozen sweet peas and can enjoy matar paneer in any season . For my matar paneer i use equal part matar and paneer by weight but you can use one part paneer and two part matar . Boil salt and water and keep aside . Heat oil and fry paneer cubes and drop in salted hot water. Heat oil in a heavy bottom pan . Add bay leaf and onion paste and cook till raw small vanish. Add ginger garlic paste and cook till everything is just golden. Add the turmeric, coriander and chilli powder . Cook for a minute on a very low heat. Add the tomato puree and cook till oil separates on medium heat. Add matar and cook for a few minutes. Drain the fried paneer cubes and add to the gravy. Add garam masala and kasuri methi and simmer for few minutes. Remove from heat and serve with roti or rice.